I think this might be the first time I’ve ever wanted something so offbeat, but the 2019 GMC Sierra with MultiPro Tailgate is giving me a serious case of envy. I live in a place where pickups rule; heck, we have three of them parked in our driveway, but not one of them has a tailgate that can do this. 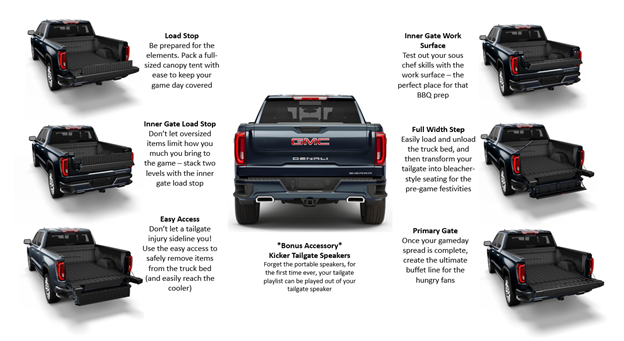 If you are shopping the new GMC Sierra Denali trucks, be sure to check out the new MultiPro Tailgate. It’s incredibly convenient, to begin with, and it comes standard on the new Sierra Denali. You can even get it with optional built-in speakers — perfect for tailgating parties, listening to while working outside, or impromptu dance parties at the ranch! I just got done personalizing the 2019 GMC Sierra Denali that I would buy if money were no object. Want to see? The only thing missing is the speaker option, which I will totally update with once it’s showing. And before you ask why I’d get white instead of red, it’s because they stay cooler in the sun (which is also why I didn’t get the black interior), and they don’t seem to show caliche dust (what our roads are made of) as badly. Maybe I should start a GoFundMe. I kid, I kid!